Chicago is home to a thriving food scene, the Cubs, and most recently, my sister and her boyfriend. I grew up visiting my dad’s family in the suburbs, but was overwhelmed by how much I’d missed all these years of visiting by not going into the city. Downtown Chicago has everything from historical architecture, modern museums and art displays, and most important a growing restaurant scene. My sister made sure we made all the essential stops on our family trip this past weekend. Spanish tapas at Cafe Ba-Ba-Reeba? Check. Deep dish pizza at Lou Malnatis? Check. Haute Southern comfort food at TABLE fifty-two? Wait… did you just say Southern food in Chicago? Check. Most known for his stint as Oprah’s personal chef, the renowned Art Smith and his staff are serving the comforts of the south to most appreciative diners in the mid-west. 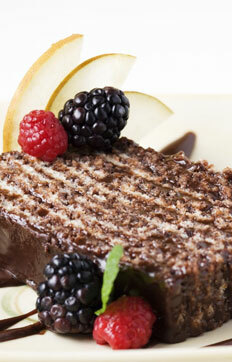 TABLE fifty-two is the meal to treat yourself to for the ultimate indulgence. From the moment you are seated in the small restaurant you are treated with outstanding service and like you are part of the family. The juxtaposition of comfort and haute cuisine are constantly battling to win your heart over, and no matter who wins you’ll love the experience. Our waitress welcomed us with two amuse bouche; small delicacies like three cheese biscuits and deviled eggs that immediately explode on your taste buds. Just when you think the restaurant is too fancy for your liking, you’ll receive your iced tea in a mason jar. The menu continues to challenge you with selections like shrimp and grits served with a spicy tomato stew and cornmeal-crusted catfish, accompanied by collard greens and a hush puppy. Unusual selections may also intrigue you, such as the pork chop with parmesan polenta, strawberries, and rhubarb. No matter how you decide to order, you won’t go wrong. Portion sizes are ample but flavors are refined. 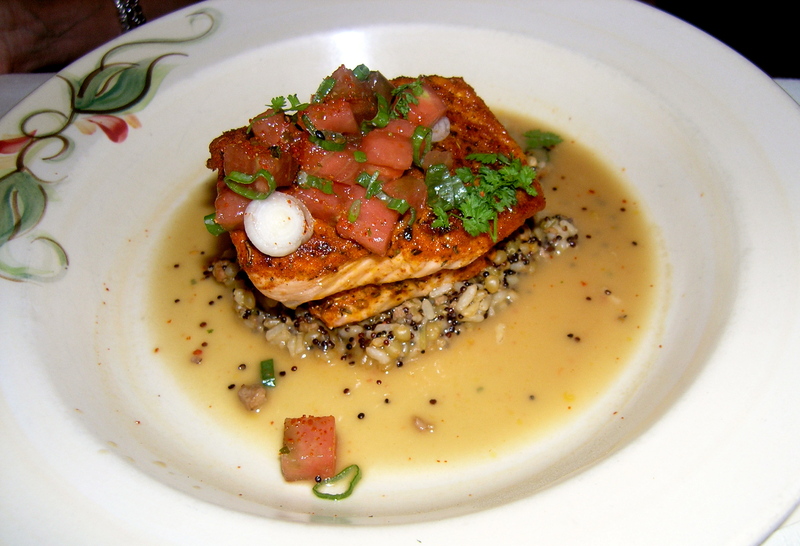 Our favorite dishes were the shrimp and grits, blackened salmon with sausage quinoa, and the fried green tomatoes. You must order the side of mac and cheese. Served in a rather large pot directly onto the table, the mac is bubbling with cheesy goodness. We didn’t even bother to put it on our plates; the pot became a trough for all the little piggys to indulge in. Save room for dessert. The Smith Family Twelve Layer Chocolate Cake is a work of art. It’s not your traditional fudgy chocolate cake like my dad desired, but instead grows on you as your palate understands the complexity of flavor. Each layer of vanilla cake is baked individually before it is sandwiched between decadent chocolate ganache. A blood orange gastrique brightens up the richness for an outstanding ending to a meal. Make TABLE fifty-two a priority on your next trip to Chicago for indulgence, impeccable service, and to be treated like one of the family. It was divine was it not? Worth the wait getting a reservation. Glad I didn’t take the leftover mac home…hard to resist that temptation.